W0748: Stela Temple – N10-27 & Stela 9Structure N10-27 at Lamanai is also known as the Stela Temple because it is home to Stela 9. 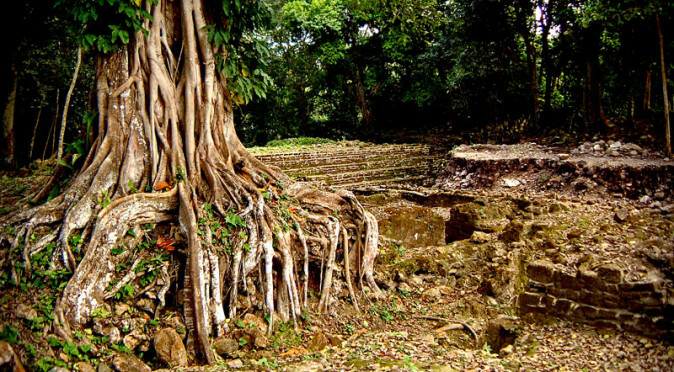 The structure was completely buried until an archaeological team from Royal Onatario Museum of Toronto took to the task of uncovering it and restoring it in 1983. They had barely scratched through the surface of the vegetation and debris when they uncovered Stela 9 and with it discovered the first monument at Lamanai with a lengthy and decipherable hieroglyphic text. Although Stela 9 was found shattered at the foot of the stairs to Structure N10-27, it was still found in a very good condition. 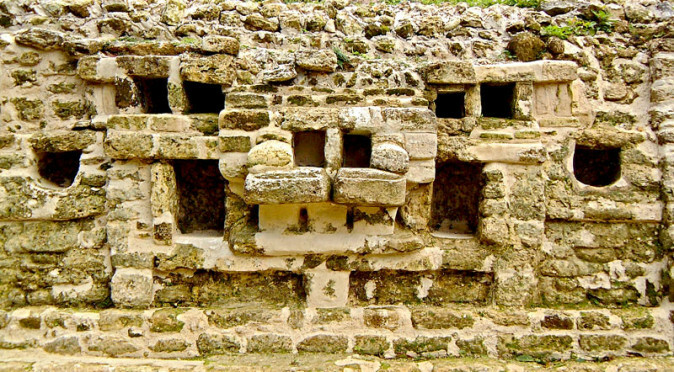 This was partly because at had been resting face down on a layer of earth that had already formed on the steps, thus protecting it from further damage. As the archaeologists excavated further, they found the base of Stela 9 in situ housed within the remains of a small temple on the terrace of Structure N10-27. The base was badly burnt, as was the small temple structure that it was housed within (a copy of Stela 9 has been put back within the ruined temple chamber, see fig. W0748). 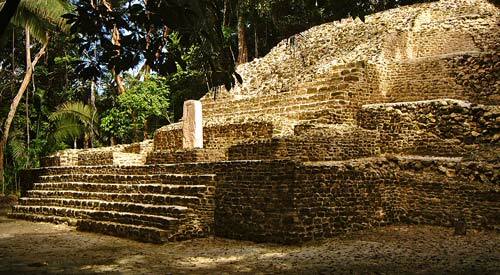 It was clear from the distance it had travelled, that Stela 9 had not fallen naturally. The best hypotheses for why Stela 9 had been cast aside are: that Stela 9 was burnt accidentally during a ritual and was therefore deemed to be cursed and had to be discarded; or, that Stela 9 was no longer harbouring good fortune and destroyed deliberately. Either way, because Stela 9 had been resting on a layer of earthen detritus, it is clear that Structure N10-27 had fallen into disrepair for a long time before this act of deliberate or accidental ritual harm came upon the stela. Stela 9 therefore provides evidence that the city and its buildings were falling into grave disrepair and yet people were still using them without attempting to repair them, thus filling in an important and large part of Lamanai’s Post-Classic history. 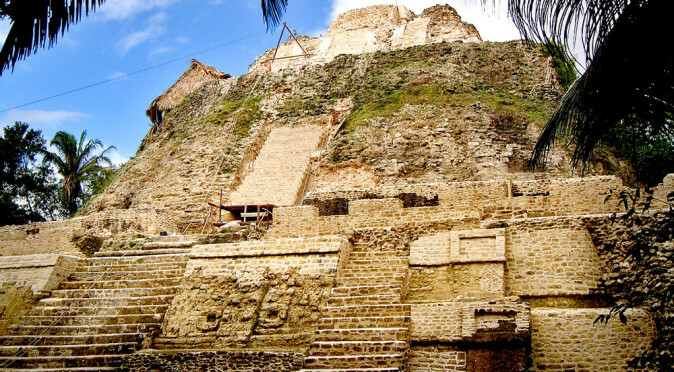 The content of Stela 9 can be inferred thanks to the work completed at other Mayan cities (in particular, Copan and Quirigua where and abundance of monuments have been found). With only stone to write on, it was imperative for the Classic-Period Maya to design an optimised method of “writing” that utilised the limited space that stone monuments provided. Therefore, the Maya developed a technique whereby every detail carved upon the stelae is designed to be read – not just the hieroglyphs – and summed together these elements could provide a lot of information. Maya stelae, such as Stela 9, follow a common theme, with an the image of a king dressed in symbolic attire, often surrounded by symbolic icons, and accompanied by a short hieroglyphic text which provides a date and a brief description. It has also become apparent that the imagery (including the attire of the king) is often symbolic of cosmological events, which in turn are symbolic of religious events or the actions of the gods (who were also celestial bodies). So the ruler’s name and outfit may reflect the position of the stars (or gods) when he was born or came to power – it is a principle that is very similar to modern “star-signs”. W0750C: Stela 9 – ColouredWe can see on Stela 9 a number of common elements that were designated to this ruler ( see fig. W0748). Firstly, he wears the serpent-monster headdress, which arguably has been developed to represent a crocodile, and symbolises his celestial/divine birth/descent. He holds a sceptre in his arms that tells us that he is a divine ruler, but could also relate to him being a “kaloomte“, or regional ruler. Such sceptres are often referred to as a serpent-bars because they frequently have a serpent appearing from the end – as this one does. The twined motif on the sceptre is thought to represent the sacred ball-game, but how that relates to this sceptre is uncertain. 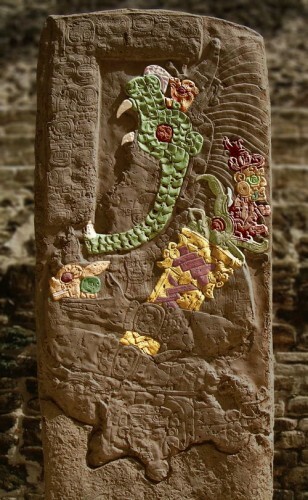 The dragon-like serpent head that protrudes from the top of the sceptre has a god appearing from its mouth, which may be the patron deity of Lamanai. 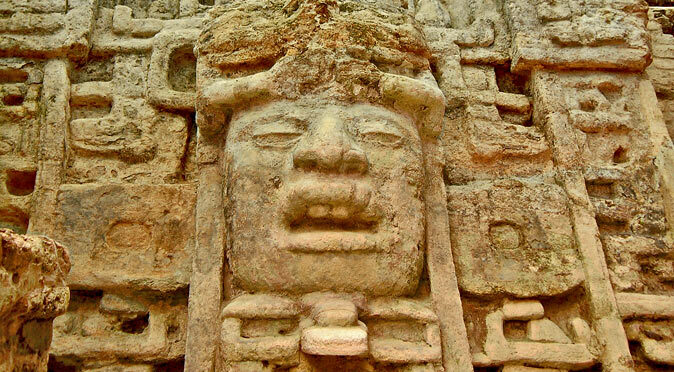 The God wears goggles and has a curling serpent seeping from the corner of its mouth, both of these devices are normally associated with the rain-gods, such as Cicoyo/Chac/Cauac/Tlaloc. There are also two uncommon elements: firstly, he clearly holds a deer in his hands; secondly, there is an little god-head sat atop his headdress – just above the eye – which looks like a bird deity and also has a curling serpent seeping from its mouth. In summary, Stela 9 was erected by Lord Smoking Shell on around the 10th March 625AD to commemorate an event and that he was a descendant of the the Spirit Crocodile lineage and Holy Lord of the Eastern Province. 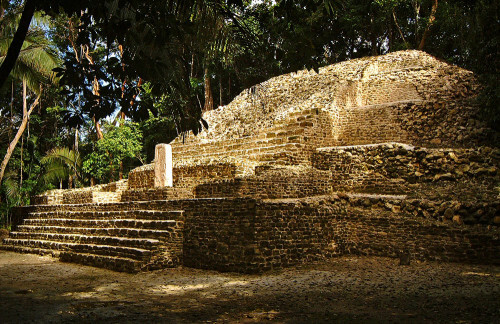 What the event was is uncertain and is most likely encoded within the imagery of Stela 9 and could either be the accession of the new king, Lord Smoking Shell, or a significant celestial event that bore huge significance to the people of Lamanai. If it is his accession, then the second date of the 3rd June 608AD would be the date that his predecessor, Sun Shark, rose to the throne. If it is another event, then the earlier date would most likely be the date Lord Smoking Shell ascended to the throne. 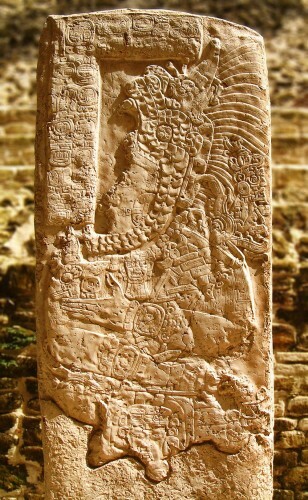 The imagery of Stela 9 has a few anomalies: the deer in his hand, which is associated with Venus; the god emanating from the serpent’s mouth, which is frequently God-K on monuments in other Mayan cities, but here it appears to be a different god and probably a rain god; the small god-head on top of the headdress, which has been dubbed the “jester” god because of the tall jester-like hat he wears, who facial features and snout-like nose are far more in keeping with images of God-K; finally, there is a nub above the nose of the serpent-monster on the headdress which is often indicative of breath and suggests the serpent-monster is alive. Because there are few monuments at Lamanai against which Stela 9 can be cross referenced, it is very hard to assemble a picture of what these artistic devices and symbols mean. However, it would seem Stela 9 is describing either the celestial events that surrounded the accession of Lord Smoking Shell and is therefore designed to inform us of his supernatural and lordly powers (his kingly star-sign), or, it describes a celestial event of particular note that needed to be commemorated.